We’re busy working on our Spring 2009 fragrance line. 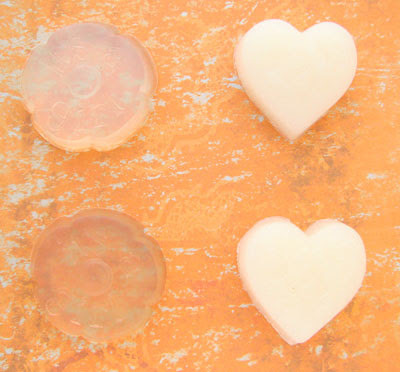 If you can believe it, the two soaps on the right are not made with white soap. They are clear soap that has been clouded by a fragrance. Obviously, those are two fragrances we won’t be adding! While soap is a science, it’s the fragrances and color and mold choices that can elevate this science into an art. But, sometimes, it’s those same art variables that can prove problematic for soap batches. Testing is important to help minimize potential surprises. For the at-home crafter, this means that “best practices” is for you is to test each new ingredient you receive in a small batch before making a large batch of your regular product even ifyour vendor has tested it . Carefully documenting each batch and making detailed notes about your personal mix of ingredients and techniques for future reference is one key to ensuring continuity from batch to batch. Hmmm, funny, we’ve been very confused about why our clear soap clouds – at first we thought it was just the sugary scents, but then a floral fragrance scotched that idea. Sigh. Then we thought it was the oil the fragrance was suspended in, but we can’t guarantee it. 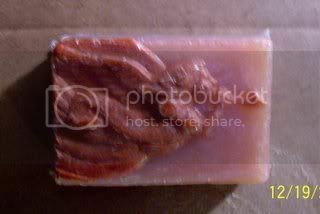 And sometimes it’s not even that, because one batch of soap we had clouded up no matter what, even though we were using the very same fragrance oil/molds/etc. that we’d used before! Very frustrating! We’re thinking it might be weather changes, the same reason sometimes our soaps sweat a lot. We’re thinking about getting a barometer! One thing we have noticed, though, is quite often the cloudy soap will clear up again if given a week or so to sit. But not always. So nice your company takes the time to take the “guess work” out of the use of fragrances/color/reaction. Thanks! I learned that lesson the hard way when this turned into this. I like how you let us know what rigorous testing goes into your products before you add them to your line….it builds up our trust for your products. I’m loving the little bath fizzies on TwitPic to the right. I wish mine would turn out so cute!